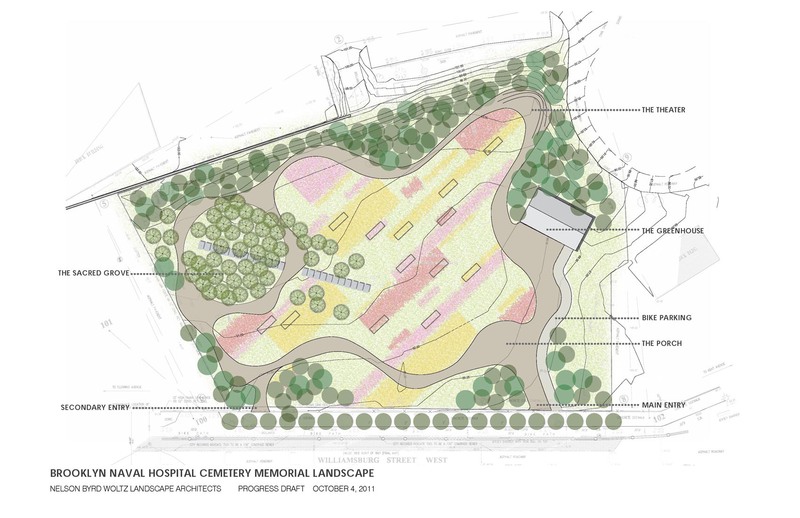 On Thursday, November 10th, Rogers Marvel Architects and Nelson Byrd Woltz Landscape Architects will provide a public presentation of their design for the Naval Hospital Cemetery Memorial Landscape. All are invited to attend and comment and discuss the designer’s progress. A year ago, the design team presented preliminary ideas and concepts to the public. Since then, they have refined the design to the design development level. The proposed design is for a landscape of native plants beneficial to pollinators such as bees, moths and butterflies that includes a large open meadow and a somewhat formal grove of trees all surrounded by a naturalized border of trees. In conjunction with Brooklyn Navy Yard Development Corporation, BGI is working to make this open space, on the Williamsburg Street stretch of the greenway, accessible to the public. BGI retained the design team in 2010 and this stage of their work will be completed at the end of this year. We are now working to secure capital funding to implement this project.